Last week my son, Sam, broke his tibia skiing. It’s a spiral fracture so I’ve learned that the x-ray view is of great importance. From one view it looks like there’s a small horizontal crack in his bone, but the x-ray shot from above reveals the crack spirals down the inner part of the bone. It’s amazing what you can learn in eight short day, and not just about tibias and x-rays. For one thing, I’ve learned that I’ve been lacking in empathy. Three of my five nephews have broken a bone in their leg or foot in the last year. Did I feel terrible for them? Of course. Did I have any appreciation for what this actually meant for them or their caretaker? Uhh, no. True empathy is always a good thing. Secondly, it’s been a good reminder that despite my plans to go here and do that, and “tear down this barn and build a new one,” the truth is I cannot guarantee that I will live another day. Instead, I want to live my life taking nothing for granted. Third, I’ve witnessed my son rally and mature this week in ways I could not have predicted. When things seem terrible, it’s a great life lesson to know they don’t stay that way forever, or in this case, for very long at all. There can be times when the fallen state of the world weighs heavy on your soul. I have been praying this week about some truly heavy things for some friends. But even in dark days, it’s good to remember that it won’t always be like that. There’s a song I used to sing a lot with my mom about this. Here are the lyrics. Jesus said, “In this world you will have trouble.” But He didn’t say it would be ALL trouble. Plus, He told us that He loves us and would never forsake us. In the midst of sorrow or on life’s mountaintop, Jesus is always there. I hope you take heart in that! The last twenty-four hours have not been the best. Since Sam did not have school yesterday — his fourth day off in a row — I took him skiing to a cute little place in Mentone, Alabama. Skiing in Sweet Home Alabama. Who knew? We started out a little rough. It was harder than he remembered. Unlike his brothers, Sam has skied very little and not in 3+ years. The place is just one hill and is served only by a tow rope. Exiting the rope was not mastered by Sam in the first ten minutes. Despite my firm instructions he kept pointing his skis down the hill as he tried to get up. I resorted to some tough love. You can’t even begin to fathom how grateful I am that this was not when he got injured. He was a little slow to warm, but definitely made huge progress. The lift guy and others were high-fiving him and giving him knuckles galore. We took a break and hilariously Sam sipped his Coke a la Elf with the “syrup coffee” in the mailroom. It cracked me up so much that I had to have him do it again so I could record it and send it to his cousin who shares his affinity for Elf culture. Sam has this magic about him where he consistently makes everything about a thousand times more fun than you’d ever expect it to be. We headed out again and he said, “Let’s ski down holding hands.” He said this not because he needed help. He didn’t. He just thought it’d be fun. And it was. After we’d spent a good chunk of the day there, my boots started to hurt. “How about five?” Sam asked. “Okay,” I said, thrilled on the inside that he was enjoying himself. I think it was his third trip up when his leg got twisted and yet he somehow kept holding on to the rope. This caused a very unnatural leg rotation — a gruesome to watch rotation, a trip to the ER, a fractured tibia and the end of basketball season before his first game. Basketball is his favorite. Unless you are our neighbor and hear the constant pounding of the ball on the pavement, you can’t possibly appreciate how much this kid loves basketball. I don’t know why God allowed this to happen. But here’s what I am praying. First that Sam will draw near to God. The Psalmist wrote: “The Lord is near to the brokenhearted and saves the crushed in spirit.” (34;18). And James tells us: “Draw near to God, and he will draw near to you.” (4:8). Sam, despite his comedic genius and gargantuan size, is still just ten years old, so I know this is a big prayer. But please join me in asking God to help Sam turn to Him in the difficulty and sadness of the days to come. Second, I’m praying that our entire family will learn all that God has for us in this season. May all five of us have ears to hear all that we need to. May these next couple months, which will look much different than we would’ve thought, be reminders that we are not in control, that God is always good, that we can trust Him even when we don’t understand our circumstances. May I draw near to God on the mountaintops of life and in the valleys, and that is my prayer for you as well. Hope you are well. I think I’ve mentioned before that Will and I are not the best at “date night.” With three athletic sons that consume many evenings, a home we love to hang out in, and a fairly consistent habit of meeting for lunch, I don’t exactly feel like we’re falling short. Still, it was lovely to have a pretty hot date last night. 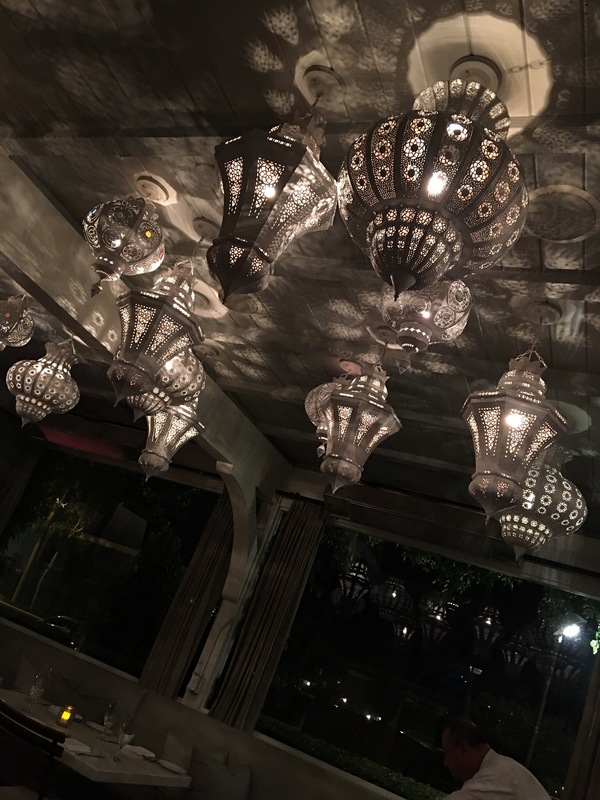 The food and ambiance were perfect — the vibe is only somewhat revealed by the picture above. “That would be great,” she said. “Thank you!” And Will fixed the basket. A few minutes later we saw that she had dropped a little cosmetic-type bag. I picked it up and took it to her before she motored too far. She had a lovely spirit about her, willing and grateful to accept help. Can the same be said of you? Because I’m not at all sure that it would ever be said of me. I think instead I may exude an “I got this”ness. Sadly. In my Bible study we are about to kick off a series covering the Sermon on the Mount. I’ve been thinking about the beatitudes. What does it mean even to be “blessed?” The very first beatitude says: “Blessed are the poor in spirit, for theirs is the kingdom of heaven.” ‭‭Matthew‬ ‭5:3‬ ‭NIV‬‬. Was the woman we encountered in the wheelchair “poor in spirit”? She did appear uncommonly comfortable with joyfully accepting help. Is this admirable resignation born out of brokenness? Could part of the blessing of God’s kingdom, that we sometimes miss, possibly be accepting our limitations? Our utter and complete dependence on God? I’m not sure what it means for the poor in spirit to be blessed. But I intend to prayerfully keep seeking an answer. In the meantime, I want to joyfully, and with a heart of genuine gratitude, accept help. How about you? How about making 2018 the year you say “Oh, I love you” to the one who offers to help? To close out our trip to Florida, Nate, Sam and I went to see the Orlando Magic take on the Houston Rockets. Will and Dub had driven home on Tuesday, and so the three of us caught the game Wednesday night and flew home Thursday morning. An old buddy of Will’s set us up with amazing seats. We were ecstatic to surprise Sam with seeing his favorite player, the star of the Rockets, James Harden. We do not know why exactly Sam decided to follow Harden in the first place, but he’s a huge fan. For years now Sam has checked Harden’s stats on a daily basis. He knows when the Rockets will be on TV weeks in advance. A life-sized Fathead poster of Harden in action greets visitors to our playroom. About a week before the game, we started giving Sam hints about the big surprise. He’s not exactly a bookworm, but we try to motivate him. “Read a chapter, get a hint,” we told him. He started tearing through his book, so excited to try to solve the mystery. One of my hints was facial hair. Nate told him it had something to do with outer space. But Sam soon tired of the hints and just wanted to know. His smile and utter delight were worth a million bucks. You may have an idea of where this is going. Guess who pulled a hamstring? Yep. 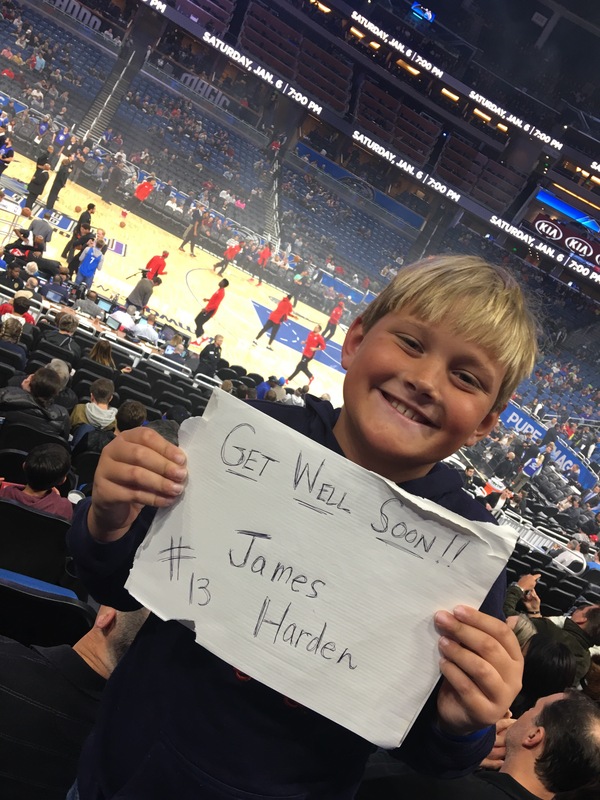 Sam’s beloved James Harden didn’t even travel to Orlando. We had seats ridiculously close to the Houston bench, but Harden was never on it. It’s an absurdly privileged problem to have. But watching your child navigate disappointment, no matter how First World it may be, is never pleasant. I try to remind myself that if I controlled the universe I’d churn out monsters. Never facing disappointments or challenges or true heart aches means you simply do not grow. I know that. I know it first hand and yet I’m somehow able to perpetually forget that when it comes to parenting. Praise God that He knows best, that for Christians, He uses all life’s experiences for our good and His glory. I may or may not see the fruit produced by Harden’s torn hammy, or from any disappointment, big or small. But I don’t need to. What I need is to trust these words from Romans. As an aside, just as Sam was holding up this sign in Orlando, my niece Caitlin was in labor NYC. Caitlin and her husband, Cam, welcomed a healthy baby boy just seconds after tip-off. Needless to say, I’m elated to have a new baby to love. I find the rhythm of life is often divinely orchestrated. Babies not only have a way of demanding that we march on in life, but that we appreciate every little thing. I’m excited to smell him, to cuddle with him, to watch him be easily awed and entertained by bubbles and birdies and balls. One of my goals in 2018 is to maximize my exposure to baby belly laughs. So, today I’m praising God for suffering and disappointments of any and every magnitude, knowing that this is how we grow. And I’m praising God for new life and the joy that babies bring! Praying that you too can embrace the necessity of suffering and the hope of new life.